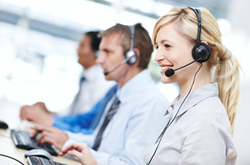 Automatic call scoring will add significant cost savings and sales optimization value to businesses of all sizes. VoiceBase, Inc. a leading provider of easy-to-use speech APIs today announced Insights, an advanced new call analytics solution. Insights, which is built on VoiceBase’s best in breed transcription engine, uses machine learning and predictive analytics technology to make sense of human voice interactions for business processes automation. By leveraging big data techniques within the voice channel VoiceBase can now surface a deeper understanding of what is said, such as the client’s intent or an agent’s behavior. Automatically scoring every sales call for example as a “hot lead”, “first-time caller” and “non-prospect”, or detecting “potential churn” and “rude agent” in support calls will save businesses billions. Telmetrics, Inc., a leading call analytics and attribution technology provider for digital marketers, plans to leverage VoiceBase Insights in its call tracking solution. “We believe VoiceBase Insights has the potential to unveil a deeper, much sought after layer of speech analytics, that up until now has been inaccessible,” said CJ Arseneau, vice president of marketing for Telmetrics. “For marketers who drive calls to local businesses, accurate lead scoring on every call, unhindered by human capacity and cost, is game changing,” added Arseneau. VoiceBase provides easy-to-use APIs that automatically transcribe audio and video, provide speech analytics with extracted keywords and topics, and predictive analytics based on machine learning technology. Every month VoiceBase processes millions of recordings that allow users to search from the web or their mobile device into the timeline of a recording, and play the precise parts of a phone call, conference call or webinar, educational lecture, podcast or video interview for example. VoiceBase’s customers include Nasdaq, FreeConferenceCall.com, HireVue, Invoca and Callcap. The company is privately held and is based in San Francisco, California.